At Mega Web Design, we specialize in developing solutions for large-scale portals and mission critical for all types of organizations. We have developed hundreds of websites for media, e-commerce, NGOs, and companies in the government and private sector. We develop on secure platforms that allow to create multiple sites that share functionalities, corporate identity and users, and that in turn allow maintaining independence of access and editorial flow. A Content Management System (CMS) is a software or set of computer programs used to create and manage digital content. CMS is typically used for Enterprise Content Management (ECM) and Web Content Management (WCM). We develop stable and secure content management systems (CMS) that allow the creation and administration of multiple users for the different websites of the corporation. The CMS allows defining and restricting access to multiple users so that they can edit content in different sections simultaneously or create new web pages that maintain the same identity, services and functionalities. With the CMS you can create all the web pages that you need to be part of the same corporate group and inherit the corporate identity, services and functionalities, without the need to contract web page developments with other suppliers. We develop applications that allow integrating our own or external services, through the development of APIs to facilitate the processes of data loading by multiple users or access services without the need to authenticate in other corporate systems. 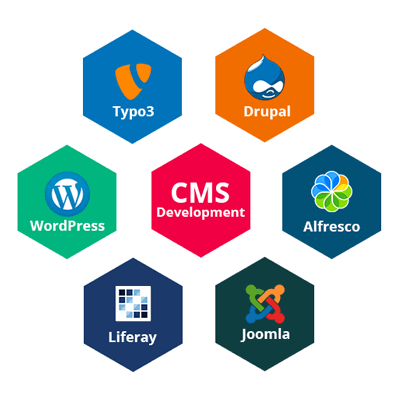 Why Choose Us for CMS Development? CMS development services offer a consultancy and integral development service. We have a multidisciplinary team of professionals in engineering, administration and design that combine their capabilities to respond to the challenges and needs of our customers in various business sectors. Our portfolio of clients includes large companies in the media, educational, governmental, and institutional and business sectors, from various countries. At Mega Web Design, we are committed to operational excellence and offer expert guidance. We use appropriate strategies and tools to ensure that our solutions generate value for our customers. We focus on the automation and administration of the IT infrastructure and our clients focus on the results of their business. Since our conception, we have built a solid and structured team that learns every day; we share the knowledge acquired in each project, which allows us to deliver solutions quickly and safely, shortening the time-to-market gap and ensuring space for innovation and creation of new solutions.